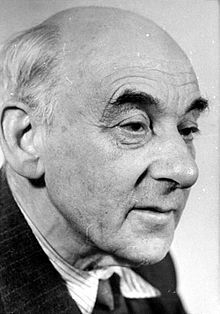 Victor Klemperer (9 October 1881 – 11 February 1960) worked as a commercial apprentice, a journalist and eventually a Professor of Literature, specialising in the French Enlightenment at the Technische Universität Dresden. He kept notes throughout the years of the Third Reich on how the German language was twisted to serve the purposes of the Nazi regime these were published as LTI – Lingua Tertii Imperii: Notizbuch eines Philologe ("The Language of the Third Reich: A Philologist's Notebook") in 1947. His diaries detailing his life under successive German states—the German Empire, the Weimar Republic, Nazi Germany and the German Democratic Republic—were published in 1995. Never - never in my whole life - has my head spun as much from a book as it did with Rosenberg’s Myth. Not because his writings were exceptionally profound, difficult to comprehend or emotionally overwhelming, but because Clemens hammered on my head with the book for minutes on end. (Clemens and Weser were the principal torturers of the Jews in Dresden, and they were generally differentiated as the Hitter and the Spitter.) ‘How dare a Jewish pig like you presume to read a book of this kind?’ Clemens yelled. To him it seemed like the desecration of a consecrated wafer. ‘How dare you have a book here from the lending library?’ Only the fact that the volume had demonstrably been borrowed in the name of my Aryan wife, and, moreover, that the sheet of notes which accompanied it was torn up without being deciphered, saved me at the time from the concentration camp. No, the most powerful influence was exerted neither by individual speeches nor by articles or flyers, posters or flags; it was not achieved by things which one had to absorb by conscious thought or conscious emotions. Instead Nazism permeated the flesh and blood of the people through single words, idioms and sentence structures which were imposed on them in a million repetitions and taken on board mechanically and unconsciously. … Language does not simply write and think for me, it also increasingly dictates my feelings and governs my entire spiritual being the more unquestioningly and unconsciously I abandon myself to it. And what happens if the cultivated language is made up of poisonous elements or has been made the bearer of poisons? Words can be like tiny doses of arsenic: they are swallowed unnoticed, appear to have no effect, and then after a little time the toxic reaction sets in after all. The Third Reich coined only a very small number of the words in its language, perhaps - indeed probably - none at all. . . But it changes the value of words and the frequency of their occurrence, it makes common property out of what was previously the preserve of an individual or a tiny group, it commandeers for the party that which was previously common property and in the process steeps words and groups of words and sentence structures with its poison. For my own part I have never been able to understand how he [Hitler] was capable, with his unmelodious and raucous voice, with his crude, often un-Germanically constructed sentences, and with a conspicuous rhetoric entirely at odds with the character of the German language, of winning over the masses with his speeches, of holding their attention and subjugating them for such appalling lengths of time. Only a year after the collapse of the Third Reich a strangely conclusive piece of evidence can be advanced to support the claim that "fanatical", this key National Socialist term, never really had the sting taken out of it by excessive use. For although scraps of the LTI surface all over the place in contemporary language, "fanatical" has disappeared. From this one can safely conclude that either consciously or subconsciously people remained aware of the real facts of the case all through those twelve years, namely, that a confused state of mind, equally close to sickness and criminality, was for twelve years [of Nazi rule] held to be the greatest virtue. But there is no vox populi, only voci populi. On countless occasions during my spell as an assistant in Naples I heard people say about some newspaper or other: è pagato, it’s paid for, it lies for its client, and then on the following day these very same people who had cried pagato were absolutely convinced by some obviously bogus piece of news in the same paper. Because it was printed in such bold type, and because the other people believed it. … I also know that a part of every intellectual’s soul belongs to the people, that all my awareness of being lied to, and my critical attentiveness, are of no avail when it comes to it: at some point the printed lie will get the better of me when it attacks from all sides and is queried by fewer and fewer around me and finally by no one at all. Anyone who took their Catholic faith seriously stood alongside the Jews in mutual, mortal conflict with Hitler. This page was last edited on 20 August 2018, at 13:06.